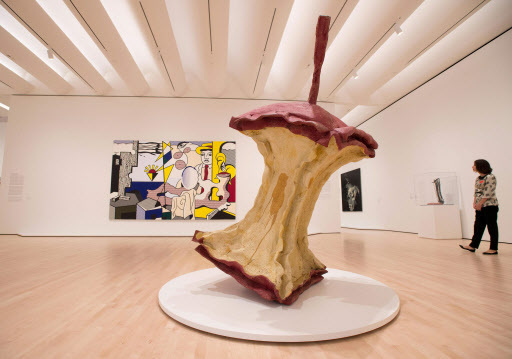 SAN FRANCISCO (AFP) -- The San Francisco Museum of Modern Art reopens in mid-May after an ambitious $305 million expansion and facelift that aims to rival the world-class art spaces of New York, Paris or London. The revamped museum will be unveiled May 14 following a three-year upgrade entrusted to the Norwegian architecture firm Snohetta -- best known for the dramatic new Alexandria Library in Egypt -- that included more than doubling the exhibition space. The brick structure that has housed the SFMOMA since 1995 in downtown San Francisco is now attached to a huge 10-floor “annex.” Outside, a wavy white facade made of more than 700 fiberglass-reinforced polymer panels seems to come alive as the light bounces off at different angles. Snohetta says the facade is meant to represent the waves in the San Francisco bay and the city’s iconic fog banks. At ground level, large glass windows invite pedestrians to enter and visit the massive steel artwork by Richard Serra titled “Sequence,” or the “Untitled” 8-meter-wide white mobile that hangs in the atrium above the central staircase. “The signature material in this building is glass,” said museum director Neal Benezra. When SFMOMA opened its doors in the 1990s, the neighborhood was shabby and affordable. Today the area has dramatically gentrified and become a symbol of the vast income disparity caused by the high-tech boom that began in nearby Silicon Valley. The new museum, Benezra stressed, “embraces the community” it is rooted in. The SFMOMA expansion more than doubles its galleries to 16,000 square meters and creates one of the largest modern art spaces in the United States. There is extraordinary work by key 20th-century artists, from Diego Rivera to Henri Matisse, Alfred Stieglitz to Andy Warhol, and career surveys of individual artists, including what is touted as a one-of-a-kind collection by the painter and abstract sculptor Ellsworth Kelly. Its new Pritzker Center for Photography, which takes up almost an entire floor, is billed as the largest in the country. The expansion was primarily designed to accommodate the huge private art collection of Doris and Donald Fisher, founders of the Gap clothing store chain. Starting in the 1970s the Fishers collected 1,100 works by 185 artists, first quietly and then on display in two galleries at the Gap headquarters in San Francisco. After looking into building a private museum, the Fishers decided in 2009 to hand their collection over to the SFMOMA in a 100-year trust. 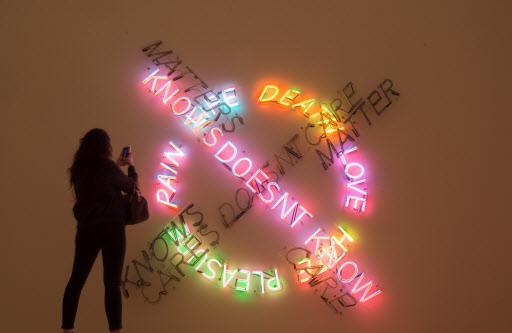 The museum will display part of the collection on several floors, with several thematic exhibits focused on pop art icons such as Warhol and Roy Lichtenstein, as well as artists who emerged in post-war Germany like Anselm Kiefer and Gerhard Richter. Robert Fisher believes that a Richter painting, “Zwei Kerzen (Two Candles)” best symbolizes the love of his parents. “It usually hung over the fireplace in our home in San Francisco,” Fisher said. Aside from the Fisher collection, the museum has enriched its own reserves thanks to a campaign starting in 2009 to convince wealthy collectors to entrust them with some of their art work. More than 3,000 pieces have been promised, including works of Francis Bacon, Alberto Giacometti, Yves Klein and Jackson Pollock. Six hundred of these will be on exhibit for the reopening.